Ukrainian boxer Oleksandr Usyk was live on Instagram and stated that he refuses from WBA champion belt. “I would like to say that WBA organization obliges me to fight with Denys Lebedev. This fight will not happen, as me and my team have decided to transfer to the super heavyweight category. Therefore, we will not fight with Denys. And I refuse from the belt. I don’t want it to be mine just for no reason. Let the guys bow for it, this is normal. I wish success to Denys and everyone. Box, win, wish you all the good,” Usyk said. Therefore, Usyk lost the title of an absolute world champion, which he got last summer in Moscow – he won the World Boxing Super Series. Now, Oleksandr Usyk is preparing to his debut in the super heavyweight. His next fight is scheduled for May 18 in the U.S. Carlos Takam might become his opponent. As we reported world champion in heavyweight Ukrainian boxer Oleksandr Usyk might debut in super heavyweight with a fight with Carlos Takam. 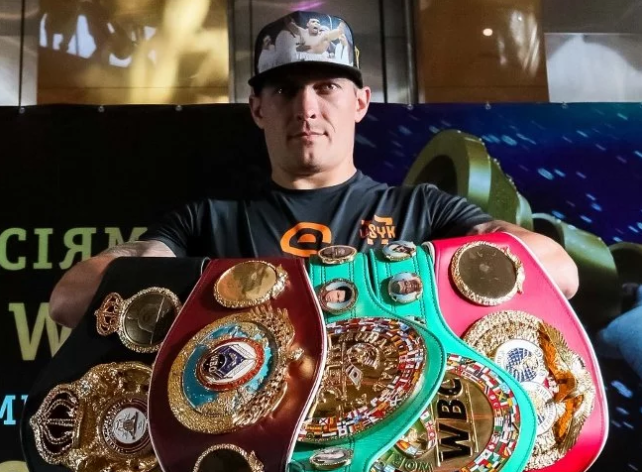 Besides, the World Boxing Association (WBA) obliged Oleksandr Usyk to protect his title against the Russian Denis Lebedev. In case of refusal, Usyk will lose the status of an absolute champion with his WBA belt. Denis Lebedev will compete for the vacant title with undefeated Lawrence Okolie.